Despite autumn being arguably the most colourful and beautiful season of them all, it’s one that can cause serious problems for your property if you’re not careful. Why? Two words: leaf mulch. While the leaves departing the trees makes the season picture-perfect, it can wreak havoc with your home. The term ‘leaf mulch’ is likely to be more familiar among the gardeners out there, but it essentially describes mushed up, decayed, soggy leaves. How can it cause problems? 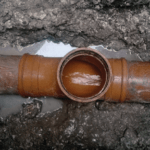 If too much debris builds up in your drainage system, it can lead to serious problems. Not only can it damage your gutters or surface water drains, but it can end up causing them to overflow. What’s more, if leaf mulch is overflowing from surface water drains, it creates a slip hazard – as anyone who’s ever stepped on wet leaves can attest to. However, you should make sure you remove leaves manually from surface water drains and other areas of the property that can be maintained without putting yourself at risk. As mentioned earlier, avid gardeners will already be well aware of the different ways in which you can actually get some good use from this excess leaf mulch. According to the Royal Horticultural Society (RHS), you should collect the leaves and moisten them if they are dry, before putting them into a bin liner that has been pierced with a knife or garden fork. The bin liners then need to be tied loosely and stacked out of sight in the garden for up to two years, where they need to decay further. When it’s well rotted (yes, that’s what you’re aiming for), you can use it for all manner of things in your garden, from solving soil drainage problems to enriching your soil. Leaf mulch: a double-edged sword, but one you need to know about this autumn.